Former President Bill Clinton applauds Former Democratic Presidential candidate, Sen. Bernie Sanders, I-Vt., as he speaks during the first day of the Democratic National Convention in Philadelphia , Monday, July 25, 2016. Democratic presidential candidate Hillary's Clinton's spouse has the unique experience of having been president himself, and on Tuesday Bill Clinton leads the list of speakers backing her campaign at the Democratic National Convention in Philadelphia, Pennsylvania. House Minority Leader Nancy Pelosi, party interim chair Donna Brazile and a group of mothers whose children have died from gun violence or in clashes with police are also scheduled to address the convention. They follow Monday's opening day where some of the party's biggest voices gave powerful calls for voters to support Clinton. First lady Michelle Obama spoke of the importance of those in the White House serving as role models to the nation's children, saying that "our words and actions matter" and that she believes Clinton is the only person qualified to be the next president. "I want a president with a record of public service, someone whose life work shows our children that we don't chase fame and fortune for ourselves, we fight to give everyone a chance to succeed," Obama said at the Democratic National Convention in Philadelphia. "I want a president who will teach our children that everyone in this country matters." Vermont Senator Bernie Sanders, who finished second to Clinton in the Democratic race, did repeatedly name Trump as he cast Clinton and her policies as the better choice in November. He spoke about how his campaign was able to push the Democratic Party to adopt several of his proposals, including Wall Street and campaign finance reform and opposing trade agreements like the Trans-Pacific Partnership. 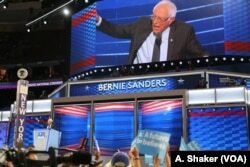 Sanders expressed his disappointment in how the nomination process turned out, but said Clinton "must become the next president of the United States." Trump criticized Sanders on Twitter, saying he "totally sold out" to Clinton and that his campaign was a "waste of time." 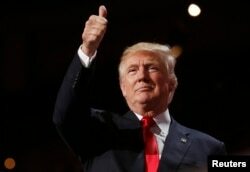 U.S. Republican presidential nominee Donald Trump gives a thumbs up at the Republican National Convention in Cleveland, Ohio, U.S. July 21, 2016. Sanders quickly fired back, "Never tweet." Trump also had comments about the night's other big speakers, Senators Elizabeth Warren and Cory Booker. But absent were any words about Obama's speech, a week after Trump's wife Melania spoke at the Republican National Convention with a passage very similar to one Obama delivered in 2008. Warren said Trump and his campaign have embraced keeping the powerful on top, as well as racial hatred, bigotry and attacks on women and immigrants. Booker, who was mentioned as a possible running mate for Clinton before she chose Senator Tim Kaine, drew huge cheers with an optimistic speech about what he sees as the country's ideals. "We can't devolve into a nation where our highest aspiration is that we just tolerate each other. We are not called to be a nation of tolerance. 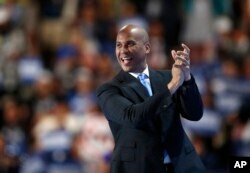 We are called to be a nation of love," Booker said. Sen. Cory Booker, D-NJ. takes the stage during the first day of the Democratic National Convention in Philadelphia. He described Trump as divisive and said Clinton was the better choice for president. Two new polls Monday showed Trump edging ahead of Clinton in the days following the Republican convention.